The occurrence of a postoperative or surgical site infection (SSI) following spine surgery is a devastating complication. Not only does it add to morbidity, financial burden, and poorer outcomes for a patient, but also it is a source of stress and concern to the surgeon. On the one hand, the advances of modern medicine have made available aggressive surgical options for a number of spinal pathologies, and on the other hand, these exact advancements have led to an increasing number of complex surgeries being performed and consequently an increasing burden of spine SSI. 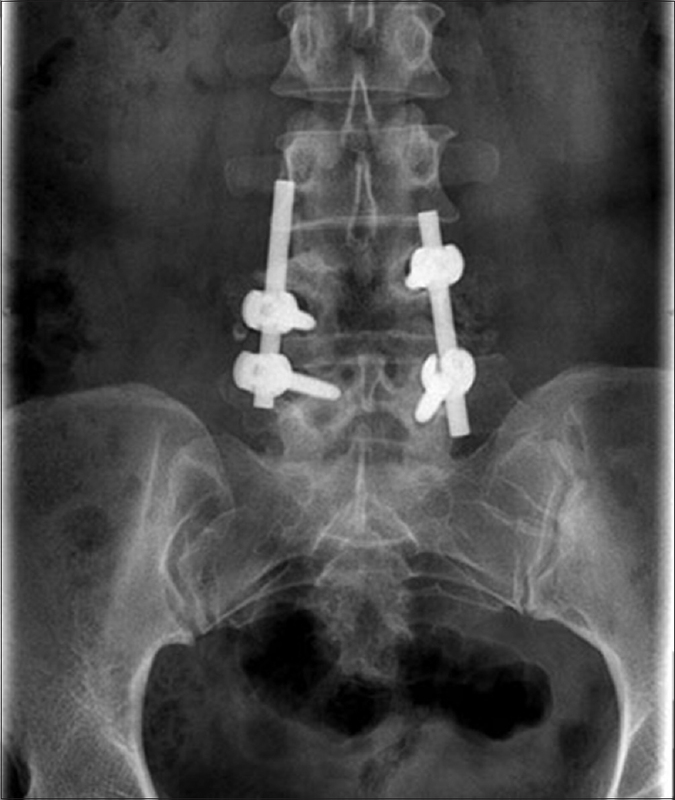 The modern surgeon has a number of options in his armamentarium when combating this complication and given the ever-changing nature of bacterial organisms as well as the evolving nature of spine surgery, a frequent review of best practices is important to stay abreast of recent advances. Furthermore, an understanding of these evolving trends will facilitate the development of new strategies for the prevention and management of this event. SSI has received increasing attention in many countries where it is seen as a modifiable indicator of health-care quality. It therefore behooves every spine surgeon to have a clear understanding of the principles of diagnosis and management of SSI. The purpose of this paper is to describe the role of surgical management in SSI. First, the general principles of management will be briefly reviewed. Then, the various surgical strategies in SSI following nonimplant and implant surgeries will be detailed. The reported incidence of SSI varies considerably and depends on a variety of factors. These include the preoperative diagnosis and invasiveness of the procedure. Reported incidences range from 1.4% to 10% with an average of 2.1%. In surgical procedures addressing degenerative etiology, it is 1.4%, 4.2% following deformity correction, and 9.4% for the operative management of traumatic spinal cord-injured patients. In general, in lower risk surgeries that do not require instrumentation such as discectomies, the reported incidence is <3%. With the addition of instrumentation, the incidence rises with rates reported over 10%. Furthermore, the rates of SSI varies based on associated comorbidities of the patient (0.7%–4.3% in the absence of risk factors to 2.0%–10% in the presence of medical comorbidities). Overall, cases that require extensive soft-tissue dissection, higher blood loss, and prolonged operative time lead on to higher rates of infection. Delayed infection after months to years of quiescence is a significant problem. The reported incidence of this is between 0.2% and 6.7%. A number of reports have demonstrated the significantly reduced rates of infection following minimally invasive surgeries (MISS). In a recent report, Kulkarni et al. described their experience with MISS in 1043 cases. Of these, 763 underwent noninstrumented surgeries (discectomies and decompressions) and 280 instrumented Transforaminal Lumbar Interbody Fusion (TLIF) procedures. There were no infections in the noninstrumented group and 3 (1.07%) infections in the instrumented group. The authors concluded that MISS not only dramatically reduces the SSI rates but also associated hospital costs. The successful treatment of iatrogenic spinal infections hinges on a high index of suspicion, early diagnosis, and a low threshold for intervention. The aim of management is the clearance of infection, sound wound closure, and the restoration of spinal column integrity. This process commences with a thorough clinical examination, bolstered with appropriate clinical and radiological investigations, and an accurate diagnosis. Hematological parameters such as the total white cell count, erythrocyte sedimentation rate, and C-reactive protein (CRP) are useful not only to diagnose an SSI but also used to monitor its treatment. Serum procalcitonin (PCT) and serum amyloid A (SAA) are other inflammatory markers that have been used for diagnosis of postoperative spinal infections. They are not influenced by factors such as age, gender, diabetes mellitus, and operative duration. PCT has been shown to be elevated in bacterial infections but not in viral infections or other inflammatory conditions., In patients with a significantly elevated baseline PCT level, a subsequent drop of >80% appears to be reasonable for discontinuing antibiotics. SAA levels reach their peak 3 days following surgery, but they normalize much faster compared to CRP. Hence, it is useful in the early diagnosis of SSI. Once a clinical diagnosis has been made, the next step is the identification of the offending microorganism. This is vital as it will guide targeted antibiotic therapy. The tissue/pus for culture is preferably obtained during the first debridement and lavage. If the patient has not been planned for a formal surgical debridement, an aspiration of the wound site is done under strict aseptic precautions. This will serve to obtain fluid for culture and sensitivity. When available, endoscopic techniques have the added advantage of being less invasive and also provides an opportunity to irrigate the wound at the same time. The following paragraphs will discuss the management of SSI in different clinical scenarios. This is usually seen after a discectomy or decompression. After a brief period of improvement in symptoms following the procedure, the patients with evolving SSI may report worsening back and leg pain with fever. The pain is often severe and is out of proportion to what may be expected in the postoperative period. If there is an evolving epidural abscess, neurological deficits may develop. In these situations and in the presence of a seropurulent discharge from the wound, a clinical diagnosis of SSI must be established. Baseline inflammatory markers are sent and recorded for serial monitoring. A magnetic resonance imaging (MRI) with contrast will help confirm the diagnosis [Figure 1]. The wound should be aspirated under strict aseptic precautions and the fluid sent for a culture and sensitivity as described previously. If an organism is identified, appropriate antibiotics should be commenced and the patient closely observed. A surgical intervention is indicated in patients who do not respond adequately to medical treatment or in those who develop neurological deficit. The patient is taken back to the operating room and the wound is explored. A methodical approach must be taken to the debridement. We prefer to first address the suprafascial part of the wound before we open the deeper layers. To accomplish this, first, the skin and subcutaneous tissues are inspected, debrided, and lavaged copiously. Once this is done, the fascial sutures are opened and then the wound is carefully inspected for necrotic muscle and bone. A deep tissue swab is taken for pus culture and sensitivity. The infected tissue is debrided until normal bleeding tissue is seen. Next, the perineural structures are examined and any enveloping unhealthy granulation tissue is removed with a Penfield dissector. If a discectomy has been done, the disc space is entered and infected tissue with loose disc fragments is removed. Generous amounts of saline and diluted povidone-Iodine fluid lavage is done intermittently during the execution of these steps. Once all unhealthy tissue is removed, the wound is closed in layers over a suction drain. Adequate wound drainage is essential to prevent the formation of a hematoma and to drain any fluid collection. We use a large bore (14 F) suction drain and prefer to anchor the tubing with a suture to prevent its inadvertent removal in the postoperative period. An occlusive sterile waterproof dressing is preferred. This is changed as and when required. Situations may arise when there is extensive destruction of bone and the need arises for anterior column reconstruction and instrumented fusion. We prefer to determine this preoperatively depending on the amount of bone and disc destruction we see on the X-rays and MRI. Either way, the surgeon must be ready to perform this step should the debridement itself require the removal of bone and disc material creating a significant residual defect. The use of titanium implants has been shown to be safe in the face of pyogenic infections. The management of SSI in the presence of implants is challenging. One of the worst consequences of a delay in wound debridement is the colonization of bacteria on metal implant leading to a glycocalyx biofilm formation. The decision to retain or remove implants in the presence of an infection is an important one and requires considerable judgment. We believe that as long as the implant is stable, it should be retained and the wound should be lavaged copiously with isotonic saline and diluted betadine as well as the infected tissue debrided aggressively. This may be done using a pulse lavage device. The irrigation fluid maybe fortified with antibiotics such as gentamicin. While performing the debridement, the neural structures must be respected and dural injuries avoided at all costs as this opens up the otherwise resistant dura to a bacterial influx and the risk of meningitis. When an implant has been placed, it is critical to achieve a solid fusion to ensure the integrity of the osseous vertebral column. In the event that infection persists after arthrodesis has occurred, the removal of the infected implant may be contemplated. When SSI occurs in the presence of implants, a suspicion of implant loosening must always be borne in mind. Tell tale signs of this include increased mechanical back pain and evidence of “halo” formation around the screws [Figure 2]. This may be confirmed preoperatively, and if it has occurred, any loose implants must be removed. The pedicle screw tracts must be curetted and “freshened.” If possible, a salvage screw of larger diameter may be used; otherwise, alternative fixation strategies such as hooks or additional instrumentation levels must be considered. As long as an interbody device is stable and serving its purpose, we believe that the benefits of its retention outweigh the risks. However, if the interbody cage or anterior plate has loosened, then it needs to be removed and an alternative strategy needs to be considered. In the cervical spine, one option is to remove the infected synthetic cage and exchange it with an autologous tricortical iliac crest strut or fibular graft. In the thoracic or lumbar spine, an anterior spinal approach may be used to address an infected interbody implant. This approach permits the aggressive removal of infected and necrotic tissue under direct visualization and optimal anterior column reconstruction. Soft-tissue cover and wound closure may on occasion be a challenge. This occurs when there is extensive soft-tissue necrosis and skin loss either due to the disease or as a consequence of the debridement. Some of the strategies to overcome this maybe through soft-tissue release procedures, attempts at secondary closure, the use of vacuum dressings or negative-pressure wound therapy (NPWT) or soft-tissue flap reconstruction surgery. NPWT has been used in open wounds. The wound is filled with gauze or foam after which the site is sealed and connected to a low suction device to create a negative pressure. The suggested mechanisms of action of this technique are improved tissue perfusion and oxygenation and reduced wound edge tension. This technique may have a role in infected spinal wounds; however, the usage must be done with caution, especially if there is hardware present. 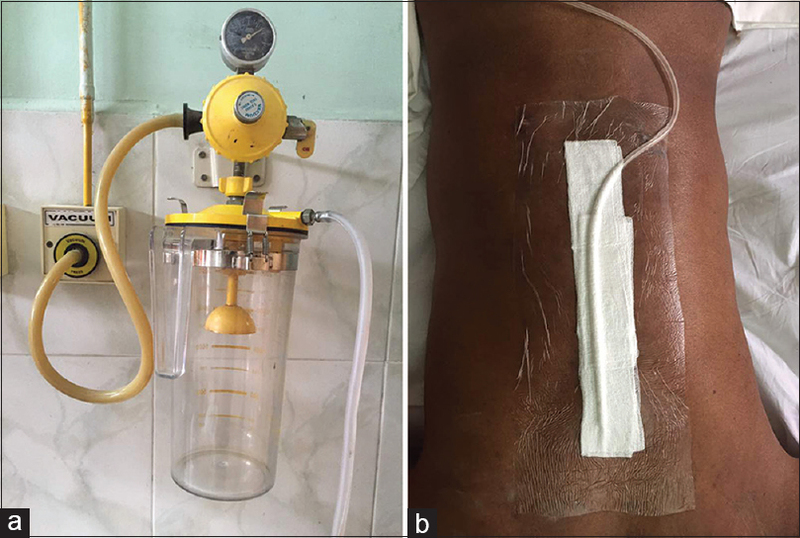 In these situations, a more aggressive strategy of wound debridement and lavage may be a more judicious approach given the risk of biofilm formation as well as chronic wound discharge. Nordmeyer et al. conducted a randomized study of 20 patients undergoing spinal fracture stabilization by internal fixation and found that NPWT was associated with lower volume of postoperative seroma. A number of commercial NPWT kits are available; however, the authors use an in-house assembled construct which is cheap and effective [Figure 3]. In cases, when NPWT is not feasible, the assistance of a plastic surgeon may be required for surgical cover through soft-tissue reconstructive procedures. The goals of this treatment will include dead space occlusion, creating soft-tissue flaps to cover the adjacent bone and metal and enhancing local vascularity to aid soft-tissue healing. Local, rotational, and free flaps can been used in these situations [Figure 4]. SSI in spine surgery continues to be a challenge in management. Preoperative medical optimization of each patient is important. A number of preventive strategies such as antibiotic prophylaxis must be employed. Operating room discipline must be rigorously adhered to. If infection is suspected hematological inflammatory parameters, imaging and tissue sample for culture aids diagnosis. The decision and timing of surgical intervention is critical. A thorough debridement is mandatory. If required, implants can be safely used in the presence of infection when deemed necessary. The stability of already placed implant is to be assessed and if sound should be retained. Finally, each member of the health-care team, including the patient, has an important role to play in order to keep the occurrence of this unwanted complication to the lowest possible level. Anderson PA, Savage JW, Vaccaro AR, Radcliff K, Arnold PM, Lawrence BD, et al. Prevention of surgical site infection in spine surgery. Neurosurgery 2017;80:S114-S123. Machado GC, Maher CG, Ferreira PH, Harris IA, Deyo RA, McKay D, et al. Trends, complications, and costs for hospital admission and surgery for lumbar spinal stenosis. Spine (Phila Pa 1976) 2017;42:1737-43. Berven S, Smith A, Bozic K, Bradford DS. Pay-for-performance: Considerations in application to the management of spinal disorders. Spine (Phila Pa 1976) 2007;32:S33-8. Smith JS, Shaffrey CI, Sansur CA, Berven SH, Fu KM, Broadstone PA, et al. Rates of infection after spine surgery based on 108,419 procedures: A report from the scoliosis research society morbidity and mortality committee. Spine (Phila Pa 1976) 2011;36:556-63. Blam OG, Vaccaro AR, Vanichkachorn JS, Albert TJ, Hilibrand AS, Minnich JM, et al. Risk factors for surgical site infection in the patient with spinal injury. Spine (Phila Pa 1976) 2003;28:1475-80. Shaffer WO, Baisden JL, Fernand R, Matz PG; North American Spine Society. An evidence-based clinical guideline for antibiotic prophylaxis in spine surgery. Spine J 2013;13:1387-92. Viola RW, King HA, Adler SM, Wilson CB. Delayed infection after elective spinal instrumentation and fusion. A retrospective analysis of eight cases. Spine (Phila Pa 1976) 1997;22:2444-50. Richards BS. Delayed infections following posterior spinal instrumentation for the treatment of idiopathic scoliosis. J Bone Joint Surg Am 1995;77:524-9. Kulkarni AG, Patel RS, Dutta S. Does minimally invasive spine surgery minimize surgical site infections? Asian Spine J 2016;10:1000-6. Boody BS, Jenkins TJ, Hashmi SZ, Hsu WK, Patel AA, Savage JW. Surgical Site Infections in Spinal Surgery. J Spinal DisordTech 2015;28:352-62. Simon L, Gauvin F, Amre DK, Saint-Louis P, Lacroix J. Serum procalcitonin and C-reactive protein levels as markers of bacterial infection: A systematic review and meta-analysis. Clin Infect Dis 2004;39:206-17. Chung YG, Won YS, Kwon YJ, Shin HC, Choi CS, Yeom JS, et al. Comparison of serum CRP and procalcitonin in patients after spine surgery. J Korean Neurosurg Soc 2011;49:43-8. Deguchi M, Shinjo R, Yoshioka Y, Seki H. The usefulness of serum amyloid A as a postoperative inflammatory marker after posterior lumbar interbody fusion. J Bone Joint Surg Br 2010;92:555-9. Ito M, Abumi K, Kotani Y, Kadoya K, Minami A. 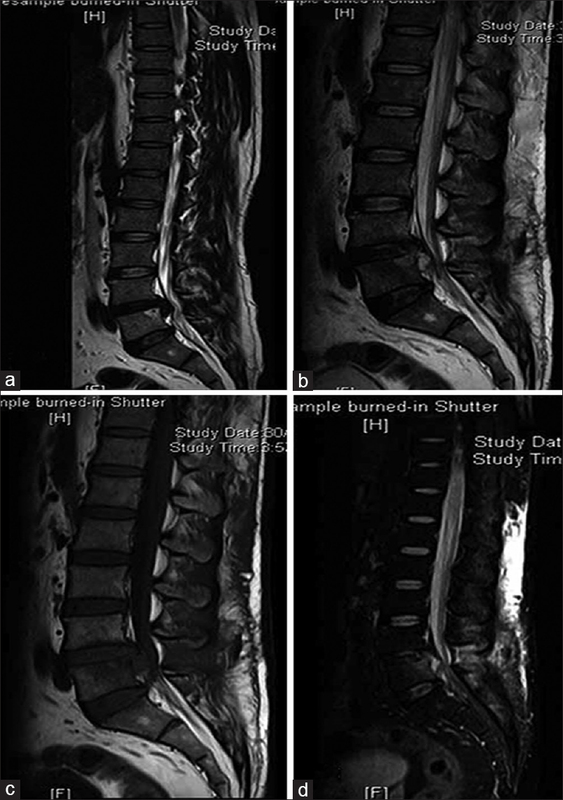 Clinical outcome of posterolateral endoscopic surgery for pyogenic spondylodiscitis: Results of 15 patients with serious comorbid conditions. Spine (Phila Pa 1976) 2007;32:200-6. Sundararaj GD, Babu N, Amritanand R, Venkatesh K, Nithyananth M, Cherian VM, et al. Treatment of haematogenous pyogenic vertebral osteomyelitis by single-stage anterior debridement, grafting of the defect and posterior instrumentation. J Bone Joint Surg Br 2007;89:1201-5. Smith J, Bhatia N. Postoperative spinal infections. In: Herkowitz H, Garfin S, Eismont F, Bell G, Balderston G, editor. Rothman-Simeone the Spine. 6th ed. Philadelphia, PA: Saunders Elsevier; 2011. p. 1789-803. Myung KS, Glassman DM, Tolo VT, Skaggs DL. Simple steps to minimize spine infections in adolescent idiopathic scoliosis. J Pediatr Orthop 2014;34:29-33.
van Herwijnen B, Evans NR, Dare CJ, Davies EM. An intraoperative irrigation regimen to reduce the surgical site infection rate following adolescent idiopathic scoliosis surgery. Ann R Coll Surg Engl 2016;98:320-3. Aghayev E, Zullig N, Diel P, Dietrich D, Benneker LM. Development and validation of a quantitative method to assess pedicle screw loosening in posterior spine instrumentation on plain radiographs. Eur Spine J 2014;23:689-94. Sundararaj GD, Amritanand R, Venkatesh K, Arockiaraj J. The use of titanium mesh cages in the reconstruction of anterior column defects in active spinal infections: Can we rest the crest? Asian Spine J 2011;5:155-61. Wang X, Tao H, Zhu Y, Lu X, Hu X. Management of postoperative spondylodiscitis with and without internal fixation. Turk Neurosurg 2015;25:513-8. Nordmeyer M, Pauser J, Biber R, Jantsch J, Lehrl S, Kopschina C, et al. Negative pressure wound therapy for seroma prevention and surgical incision treatment in spinal fracture care. Int Wound J 2016;13:1176-9. Raj M, Gill SP, Sheopaltan SK, Singh P, Dinesh, Sigh J, et al. Evaluation of vacuum assisted closure therapy for soft tissue injury in open musculoskeletal trauma. J Clin Diagn Res 2016;10:RC05-8.